Sin Color’s Valentine concert: hip hop, romance, nostalgia, and Mariachi Reviewed by Patrick O’Heffernan on February 22, 2019 . Valentine’s day in LA is a major excuse for a party. Almost every music venue in the city produces some sort of celebration on the Friday or Saturday following V-Day, ranging from rooftop pool parties with bubbly and brand name DJ”s to local bars inviting folks for “romance cocktails” and acoustic love song bands. Prices vary from free to far more than I can afford. What I could afford, and would not have missed at any price, was Sin Color’s Valentine’s Day celebration at the Civic Center Studios in DTLA on Saturday night. I went last year was treated to a wondrous night of romance and music, so I was curious to see if the operatic-cumbia-Mexican-folk-rock-duo/band could pull off another magic night. I even decided to take my wife instead of my video camera – risky, if the romance didn’t happen. It did, along with hip hop, nostalgia and Mariachi. Civic Center Studios owner Pete Galindo had anticipated a large band and large crowd, so the stage was expanded from last year and the balcony was set up for an overflow. This allowed for projections behind the bands and plenty of space for musicians. It also allowed for romantic tables for couples the floor, where they could be – and were – serenaded. Plus, it left space for musicians to stroll and sing on the floor as well as on the stage – a critical element in Sin Color’s production design. 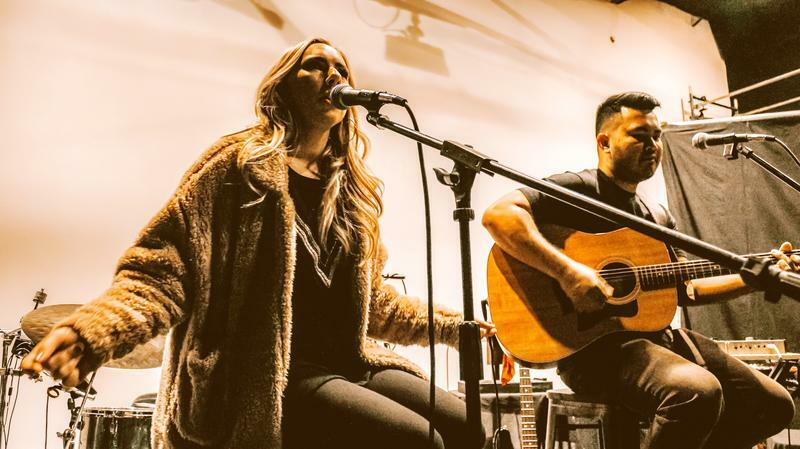 A little after 9:30 pm the up-and-coming country/Americana singer/songwriter Sophie Lynn took the stage with a guitar accompanist and instantly brightened up the room with her laughter, shining eyes, and upbeat folk and country songs that opened the night with a sunshiny feel. We were off to a great start. It got even better when Weapons of Mass Creation came on stage. One of SoCal’s most interesting hip hop/soul bands, WOMC counts five siblings among its six members from the Anaheim-based Franco Family. They started out as the Franco Funktion, a jam band zigzagging through reggae, cumbia, and hip-hop and then evolved creatively to tackle political and social justice topics. That was all in evidence as they pulled the crowd into the stage and got them clapping and moving with hip hop lyrics and cumbia beats. A sharp contrast to the Americana style of Sophie Lynn, the transition was seamless – Sophie set a tone, brought light and smiles to the CCStudios, and then WOMC added kinetic energy – and more smiles. I would not have thought country and Americana would blend so well on the same bill as hip hop, but it did – a testimony to Sin Color’s show production skills – they know how to create magic from very disparate materials. Even more disparate materials marched in as soon as WOMC left – a full Mariachi band in costume, led by Crisia Regalado, the voice of Sin Color. Crisia and the band serenaded a blushing couple at a table near the edge of the stage while dozens of cellphones flashed. The magic was palpable; this was what people had come for — a romantic moment that no other venue could offer. After leaving the now embarrassed by happy couple, Crisia and the band strolled to the center of floor and serenaded the people at the lower level tables while clicking cameras and flashing phones lined the balcony above them. Crisia’s operatic voice sailed over and through the Mariachi music, encircling even the people in the wayback of the balcony. This being LA, a hotshot video crew was on hand to record it, led by Vinny Holbrook, Creative Director for the buzz-worthy Vango Studio, which works with upcoming bands, and artists. Vinny and his team were there to video Sophie Lynn, but they were having so much fun that they stayed to enjoy and shoot the entire night, upping the excitement as Vinny and his camera moved across the floor in front of the stage. It felt like Hollywood in downtown. Crisia returned with the full Sin Color band, managing to be both resplendent and demur in a red velvet dress and her trademark 5-inch heels. The Sin Color set opened with the bossa nova flavored “Confusion” in Spanish, from the Sin Color Demo, moved to “Recitame el Major” from their 2014 Bella Luna demo, and transitioned to English with Minnie Riperton’s 1975 hit “Loving You”, a perfect dose of romance nostalgia for a Valentine celebration. 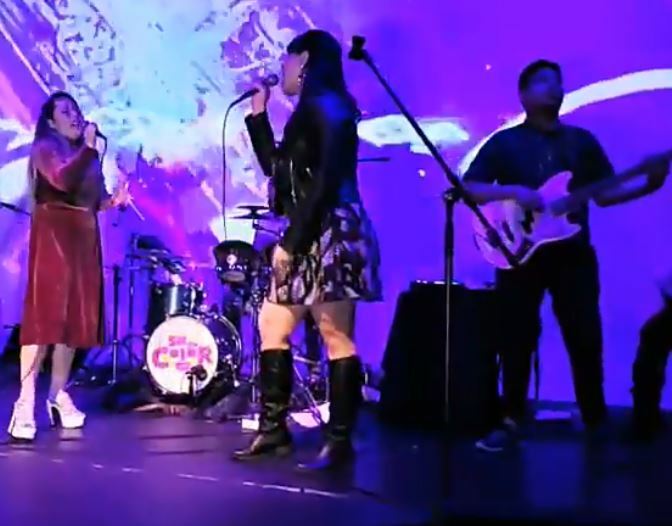 Crisia moved between English and Spanish with “Gata Bajo la Lluvia”, “How Deep is Your Love”, and her cover of Rosie Mendez Hamlin’s 1961 smash hit “Angel Baby”. She was joined on stage by the Latin Grammy nominated Alih Jey for a duet of the Roy Orbison/ Joe Melson 1961 song later popularized by Linda Ronstadt, “Blue Bayou”, which brought the house down. Staying in English, Crisia gave us her version of the Carpenter’s 1970 hit “Close to You”, still romantic 50 years later, followed by their own “Unknown Kiss” from the Sin Color album. The mood switched back to current dance with their 2017 hit Pensamiento that showcased Crisia’s opera skills as her soprano and mezzo soprano notes floated throughout the studio, accompanied by cheers and applause. The evening ended with high-impact cumbia, “La Siwanaba” which got everyone to their feet, jamming the floor in front of the stage and spreading to the balcony. While most of the audience was not alive when most of the night’s nostalgia songs were first released, they knew them (you can’t keep a good song down) . And they knew the current songs delivered by Sin Color, Sophie Lynn and WOMC. Which made the mixture of old and new, Spanish and English, romance and amor, pop and Mariachi, both familiar and unforgettable.